Our serviced apartments are designed for the independent and discerning traveller who is looking for more than a hotel room. We are located in the heart of historic Salisbury, just a 10min walk to the Cathedral, or Market Square, and a 2 min walk to Salisbury train station. We are also an excellent base to explore the world heritage sites Stonehenge, and Old Sarum. Peartree is your sanctuary in the heart of the city. Each apartment comes complete with a fully equipped kitchen, a space to lounge whilst watching TV, and a bedroom with luxurious king or super king size beds. Peartree features free wifi throughout, an off street car park, a complimentary welcome breakfast, and a free laundry room with washing machine and dryers available to guests 24/7. At Peartree we have no minimum stay, so if you are in town for 1 night or several months we look forward to welcoming you and helping you feel at home in beautiful Salisbury. For enquiries over 28 days please call or email us for additional rates and availability. You can do so much more in your apartment than a hotel room. You can choose to eat in or out, have friends around for dinner, have your favourite beer or wine in the fridge, host a business meeting, and even do your daily exercise routine while watching Netflix. Whether you are in the area for a couple of nights or much longer we know you will feel at home. 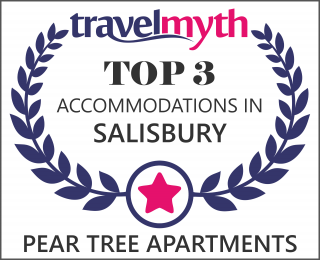 Peartree is ideally located in the centre of Salisbury and just short 10-15 min drive or bus to Stonehenge, Porton Down, Boscome Down, Amesbury, Stockbridge and Andover. If you are looking for ideas or inspiration on what to do or see while staying in Salisbury, take a look at our our Local Area guide. From walks through the beautiful Wiltshire countryside to fine dining on the market square.